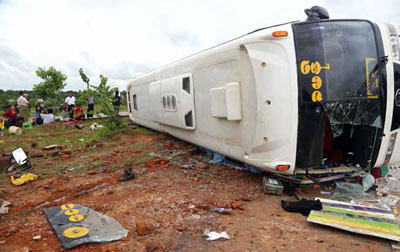 Fourteen people were killed and 30 were injured when a coach bus skidded off a bridge earlier this week while driving on the Yangon-Naypyitaw-Mandalay highway. Accidents on this highly trafficked road have seen 80 people killed and 350 killed already this year. This article from the archives, first published in the Oct. 2013 print issue of The Irrawaddy magazine, takes a look at the history of the “death highway” and why it’s so dangerous. YANGON — In 2005, Myanmar’s junta ordered its military engineers to quickly build a new road that would connect Yangon with Mandalay and the country’s brand new capital Naypyitaw, and in 2011 the 366-mile road was completed. But few funds were invested in safety measures and engineers admit the project was a rush job. As Myanmar’s roads become busier and more dangerous, the new road has emerged as the country’s foremost “death highway,” with at least 432 crashes resulting in 216 deaths and 678 injuries between March 2009 and April 2013, according to data from the Highway Police. In the first seven months of this year alone, there have been 146 fatal accidents, involving 84 deaths, the official figures show. And this is just the tip of the iceberg, as many motorists manage to avoid becoming deadly statistics by narrowly escaping life-threatening accidents. In July, the highway claimed one of its most famous victims when well-known singer Soe Tay’s car punctured a tire, skidded off the road and plunged five meters into a gully near Meikhtila Township. The singer’s 22-year-old girlfriend Ma Chaw Chaw died on the spot, but he survived with severe head injuries. Highway Police Col Nay Win said the fatal accident was one of many tragedies that are taking place on the highway. “We have to deal with several accident cases every day,” he said. The high number of crashes along the Yangon-Naypyitaw-Mandalay highway is indicative of a growing national road-safety crisis. As the country’s road network expands and the number of cars plying its roads increases, so have the number of traffic deaths and injuries. In 2012, there were 9,339 traffic accidents leading to 15,720 injuries and 2,653 deaths nationwide, according to government figures supplied to the World Health Organization. The numbers represent an almost 100 percent increase in fatalities in Myanmar since 2005, when 1,331 people were killed in traffic accidents across the country. The number of traffic accidents is expected to rise even faster in coming years after the government lifted car import restrictions in October 2011, leading to a surge in car sales in the country. Currently, the number of traffic deaths in Myanmar stands at 15 per 100,000 people, compared to 38 per 100,000 in Thailand. But the relatively low figure for Myanmar is hardly a sign of better road safety, as Thailand has 16 times more cars than its much poorer neighbor, according to recent auto market research carried out by Deutsche Bank. And while the situation is alarming everywhere in Myanmar, the rate of deadly accidents on the highway linking the country’s three most important cities is especially worrisome, as it reflects the shoddiness of much that has been built since a frantic burst of construction began about a decade ago. The former military regime prioritized rapid development of a new highway between Myanmar’s major cities after it began its construction of the new capital Naypyitaw. Located in central Myanmar between Yangon and Mandalay, Naypyitaw was completed in 2005. Using forced labor and working at a demanding pace set by their superiors, military engineers built the Yangon to Naypyitaw stretch between October 2005 and March 2009 and the section from Naypyitaw to Mandalay between July 2008 and December 2011. The project was plagued by accusations of corruption and a shortage of funds, and was built without support from multilateral donors such as the Asian Development Bank, which funds high-quality road projects across the region. Ministry of Construction engineers acknowledge that the finished product left much to be desired—and that road safety was a low priority. “There are weaknesses,” U Kyi Zaw Myint, chief engineer of the Ministry of Construction’s Public Works Enterprise, acknowledged in an interview with The Irrawaddy. Engineers say, however, that this means the public has extra responsibility to drive safely on the below-standard highway, adding that accidents are usually due to drivers’ carelessness, or because they were speeding or drunk-driving. U Kyaw Lin, director of the Public Works Enterprise, agrees that a lack of safety consciousness is a major cause of the high death rate on Myanmar’s roads. “Myanmar needs to adopt the practice of people wearing seatbelts,” he said, adding that many deaths are caused by people who drive recklessly and fail to fasten up. Some 5,000 passenger buses and cars drive on the road daily, according the Ministry of Construction. Heavier trucks transporting goods are only allowed to travel on the old Yangon-Mandalay highway. According to some drivers who use the road regularly, tire punctures caused by the road’s concrete surface are a leading cause of accidents. “The concrete road causes flat tires, especially on hotter days,” said U Aung Myint Kyaw, a taxi driver. Engineers said that the government hopes to attract international donor funding to upgrade the road and widen it to eight lanes in the coming years. The US government announced during President U Thein Sein’s trip to Washington in May that it would allocate some donor funding to improve the Yangon-Naypyitaw-Mandalay highway.